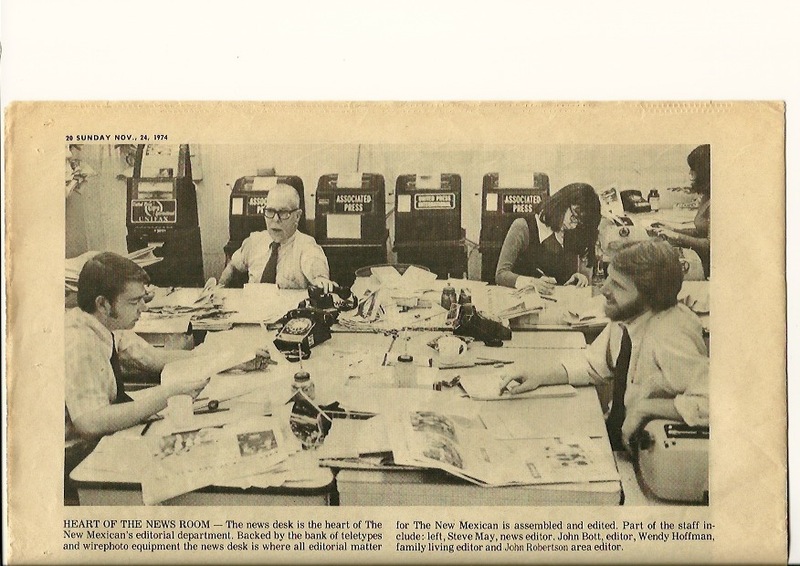 Momentarily without the cigar in his mouth, sleeves rolled up, that is John R. Bott, late editor of The New Mexican and former city editor of the New York Post, reaching for the phone and growling orders as he makes sure the paper gets out in Santa Fe in 1974. Mr. Bott — and I never called him anything else — gave me my break in the newspaper business. Working his way up from copy boy to running the newsroom, Bott had been at the Post in New York for nearly 40 years before coming west to edit The New Mexican. I was tending bar in downtown Santa Fe and Bott knew my father from older newspaper days. He remembered me from my periodic pleas — over two years, I think — to give me a shot. He was on his way out of the restaurant where I worked one night and I’m sure he had downed two or three of my martinis. He looked back over his shoulder as he passed the bar and asked, “You still intererested in the newspaper business?” “Yes, sir, Mr. Bott. I always will be,” I remember answering. He started me on a six-month tryout that Monday at $99 a week. I listened to every word he said. He had me lay out pages and write headlines to start, even though I didn’t know a pica pole from a photo wheel and only the backshop guys kept my my invariably foot-long heds from ending my career. I think he started me on the desk just to keep an eye on me. Every morning but once, I made it in before 6 a.m to rip the wire, clean the blade on the Unifax photo machine and plop Mr. Bott’s cup of coffee on his desk just before his wooden leg and the tip of his first cigar jutted, right on time, through the newsroom door. He finally sent me out on my first reporting assignment, probably chuckling after I left. Unless it truly was a nightmare, I believe it was a conference of nuclear physicists at St. John’s College. All I remember is a huge blackboard covered in hieroglyphics. I kept bartending for a while to make ends meet, although still not earning enough — as Mr. Bott would discover the morning I slept through my wire machine and coffee-making duties — to have a home telephone. But under his seasoned eye, I eventually got my legs under me as a newspaper guy. Forty years later, I remain grateful, although not rich. Very nice. I wonder how many of us owe our careers to John Bott. He was an exceptionally good (and patient) mentor.